Dec. 17th proved to be a very special day for three fifth grade girls who are part of the JCPRD after school class at Gardner Elementary. 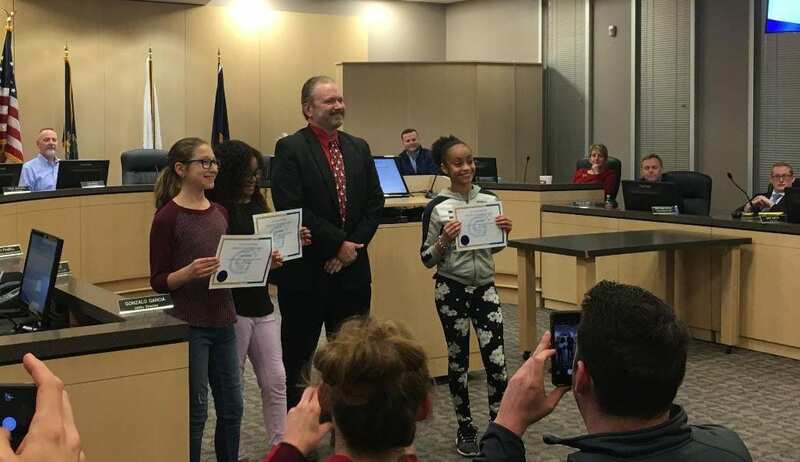 Bella Conley, Jayda Bradley and Elaina Herman were invited by Steve Shute, Gardner mayor, to play a medley of Christmas songs at city hall. Bella and Jayda both play violin, and Elaina plays piano. Their concert began at 4 p.m.
Whatever butterflies they had initially dissipated and gave way to beautiful music. After they finished, amid the many smiling faces, and applause, Shute walked up and asked them if they would mind repeating their performance later that evening after the city council meeting. That evening Bella and Jayda played “Up on the Rooftop,” and “Jingle Bells.” Elaina preformed a classic rendition of “Frosty the Snowman” on keyboard. After they finished, Shute presented each girl with a certificate of appreciation.